Portable loading docks are used in combination with dock-to-ground or yard ramps. 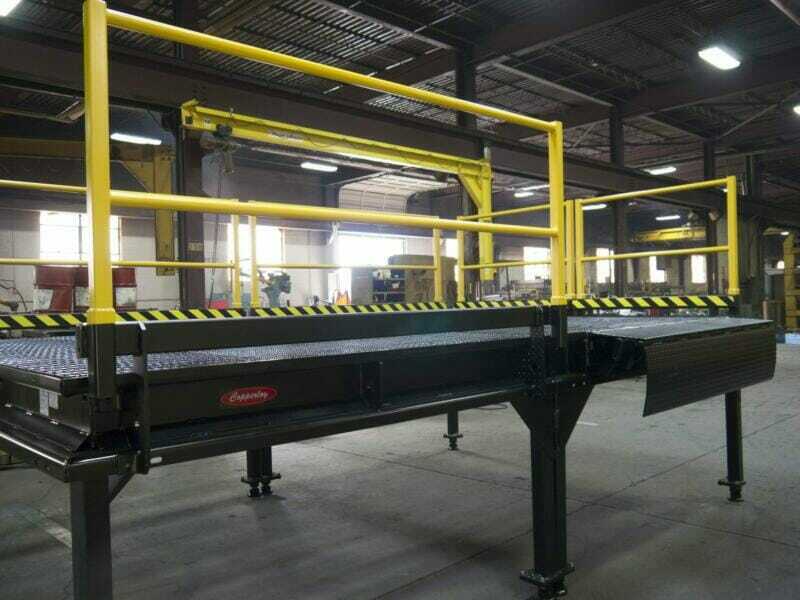 This material handling equipment is best used for parallel loading on carriers or docks in limited space locations, or where no permanent facilities exist. These portable loading docks are for sale in steel only. 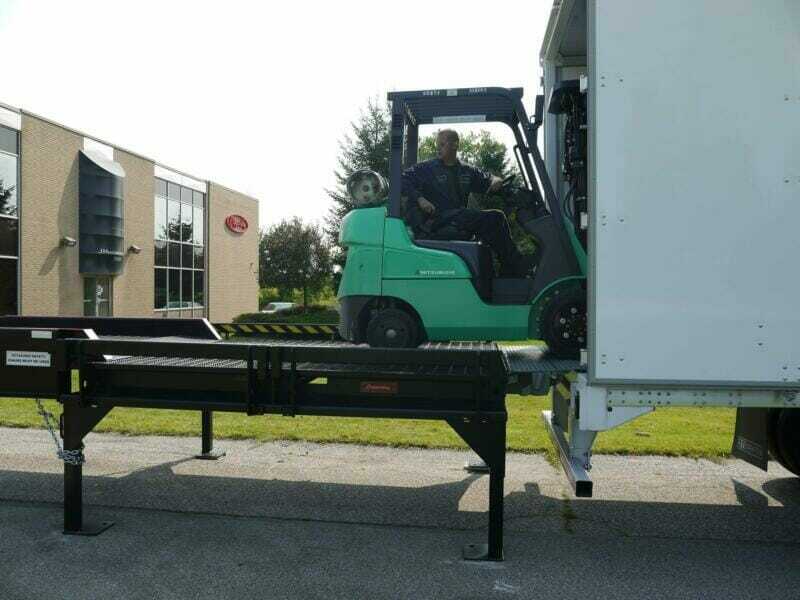 A movable loading dock, also known as a portable loading platform, allows lift trucks to easily make right angle turns. The platforms are custom made to fit your specifications with fixed heights ranging from 42″ to 57″ and are available in capacities up to 60,000 pounds. These platforms have side plates made from A572-50 steel, providing additional durability. For high-quality, durable, and versatile portable loading docks, there’s no better choice than Copperloy. Two or more portable loading docks can be locked together to form larger portable loading docks. 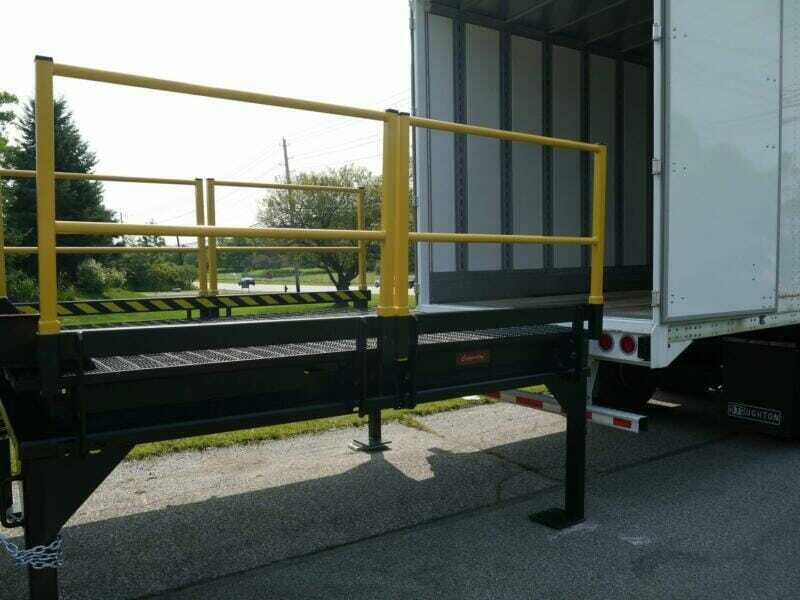 Each portable loading platform comes standard with steel grating deck, steel legs, two movable curb sections, and lift sleeves for safe easy handling by fork trucks. Edge-of-dock levelers can be installed on any side of the platform, ensuring functionality with any existing equipment, vehicles, or installations. 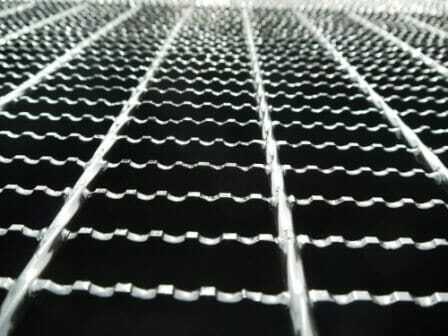 Steel grating bars don’t need maintenance and are spaced to allow debris and water to fall through, rather than collect on the surface. 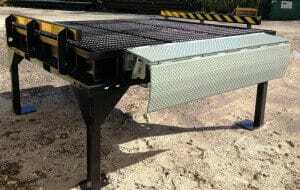 6″ portable loading dock safety curbs to prevent accidental runoff. Exclusive hollow section design and proprietary box frame construction take the stress of heavy loads and the extra strain of cargo breakout. 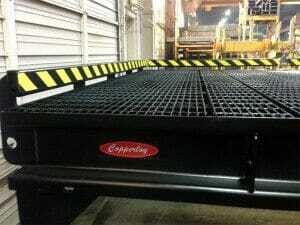 A mobile loading platform from Copperloy is constructed of electro-forged serrated steel for superior strength. Grating bearing bars are 1-3/4″″ thick. These bars are designed to offer extra durability in the roughest of applications. Bars are spaced 1″ apart to resist clogging of debris and to ensure an all-weather, high-traction running surface. Part of making a platform portable is creating easy ways to move it! Lift loops are provided for easy handling and repositioning of the platforms with a forklift. Steel Platforms come in capacities up to 60,000 pounds and lengths reaching 12 feet. Steel platforms are heavier and require a forklift to move, but have higher capacities. Contact the factory for portable steel platform specifications. Handrails can be added to any platform at any length required. Our 42-inch high split handrail are constructed in all steel. With an in-house engineering team, Copperloy offers tailor-made temporary platforms for any unique problem or specification.